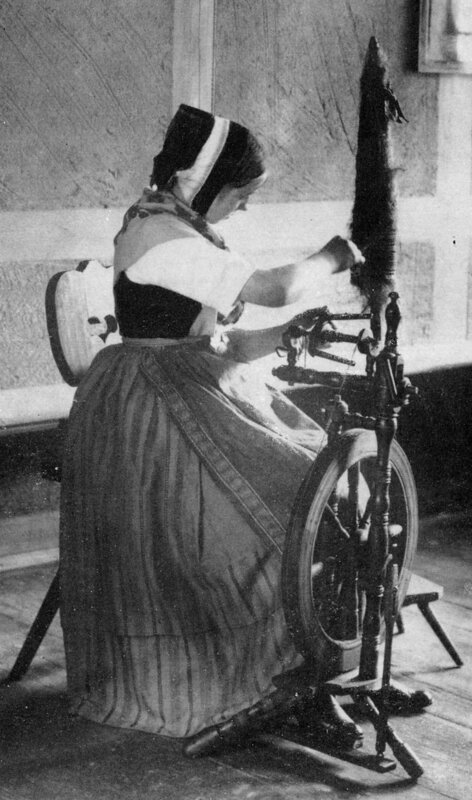 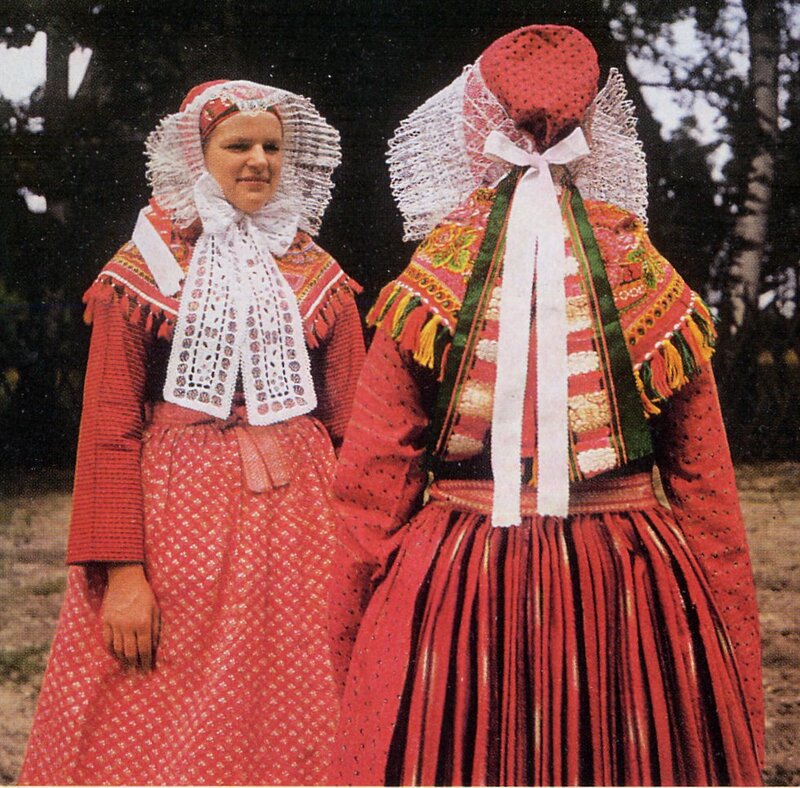 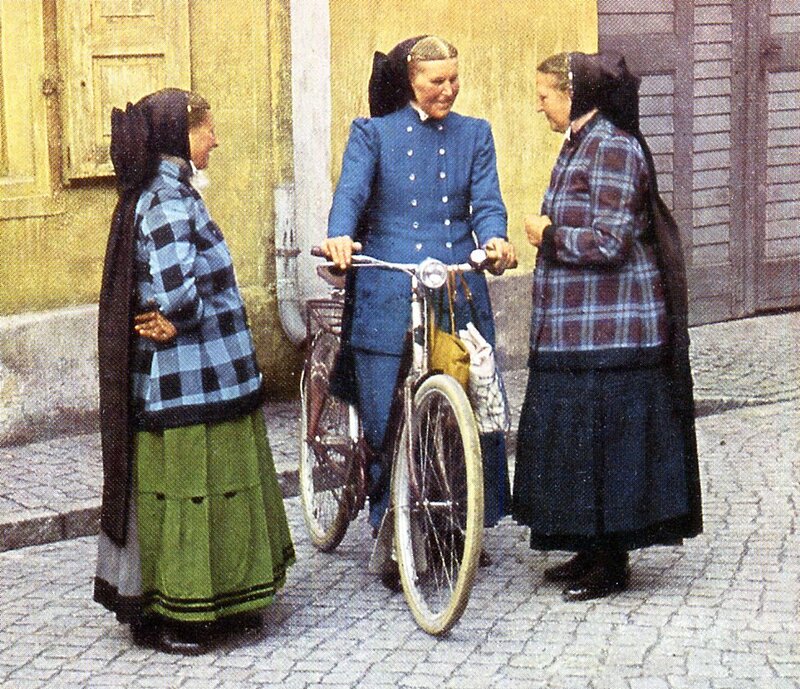 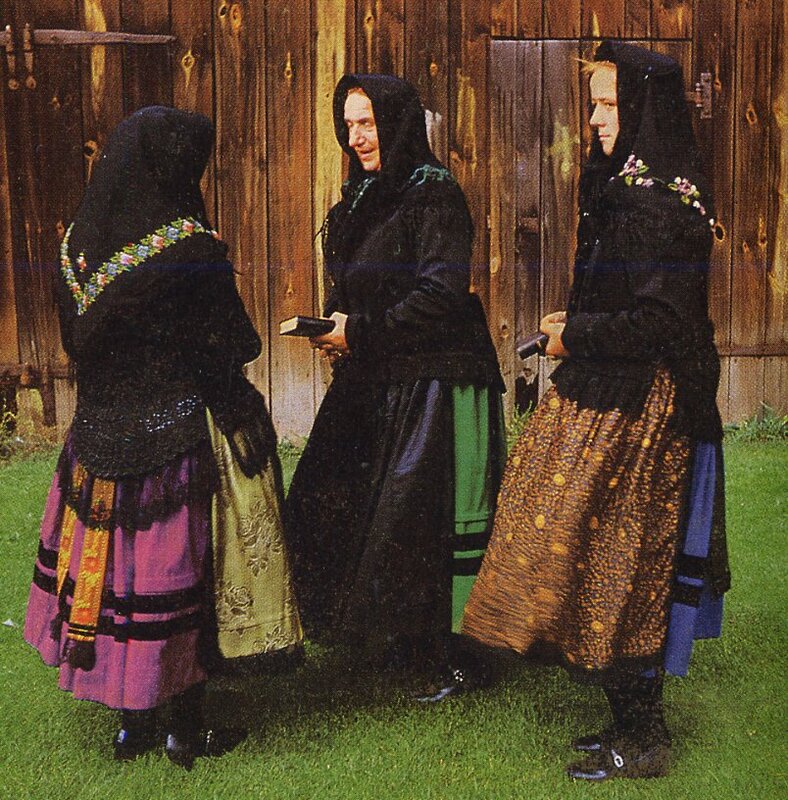 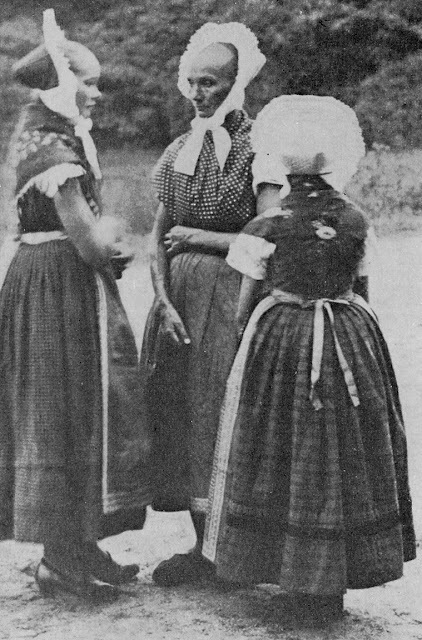 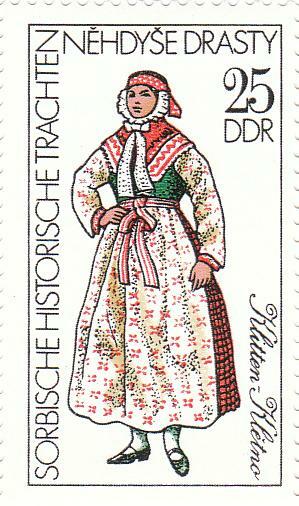 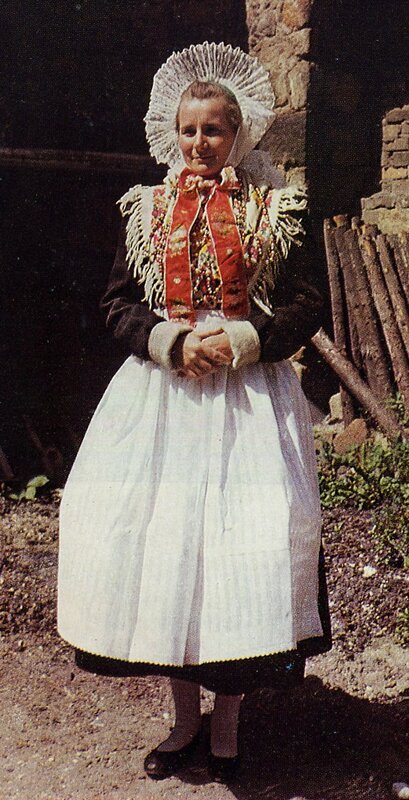 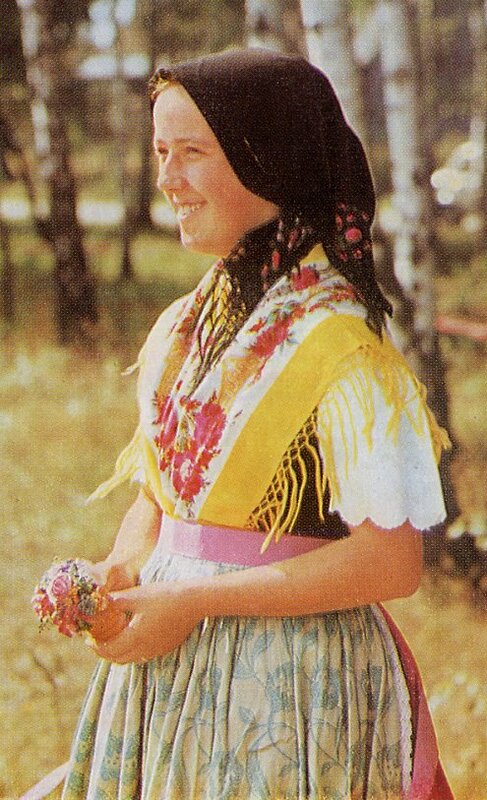 Today I will be doing an overview of the costumes of yet another of the minority peoples of Europe, the Sorbs. 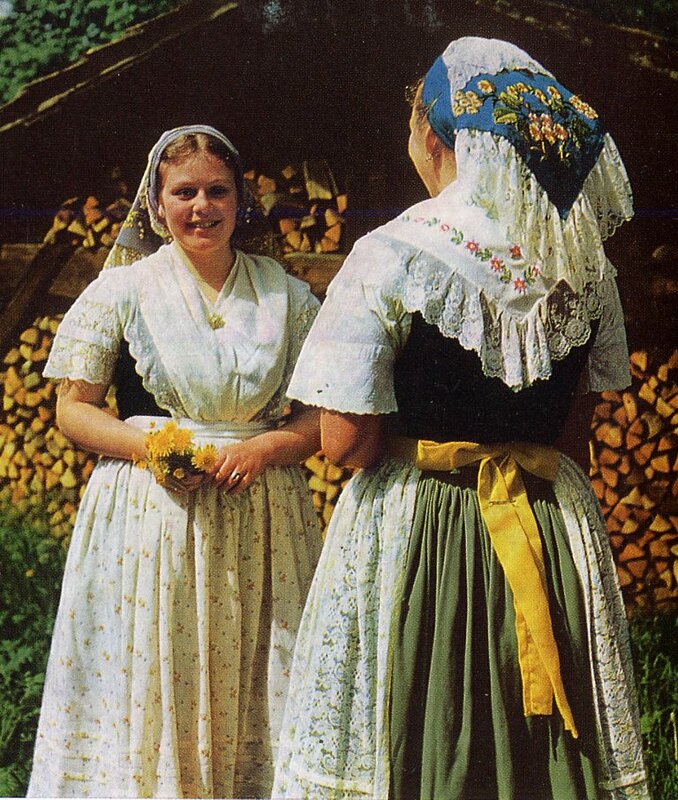 These people are also called Lusatians, and sometimes Wends. 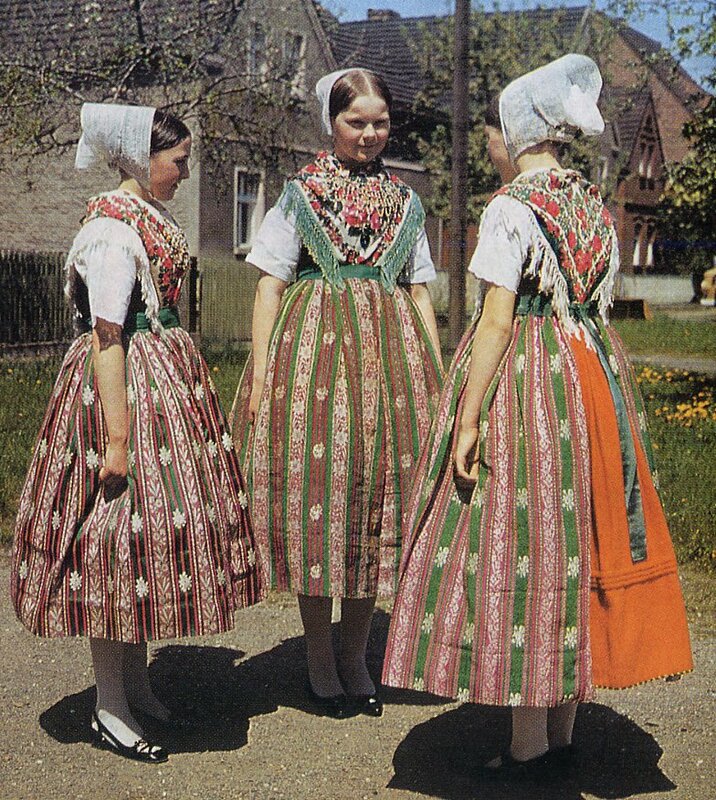 Lusatia is the name of the area in which they live, and Wend is an old Germanic term for 'stranger', it is cognate with the term Welsh, meaning someone whose language is totally other. 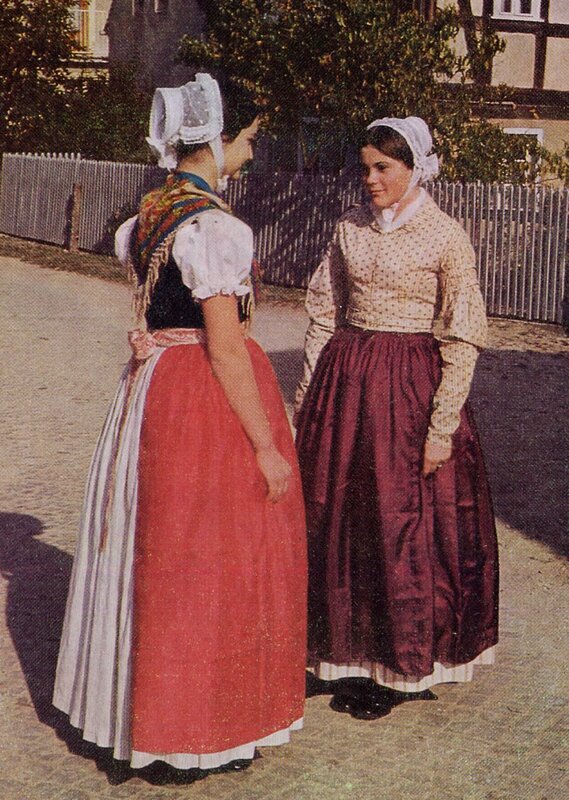 [One the flip side, Slavs refer to Germans as 'Nemets', which means 'mute', i.e. 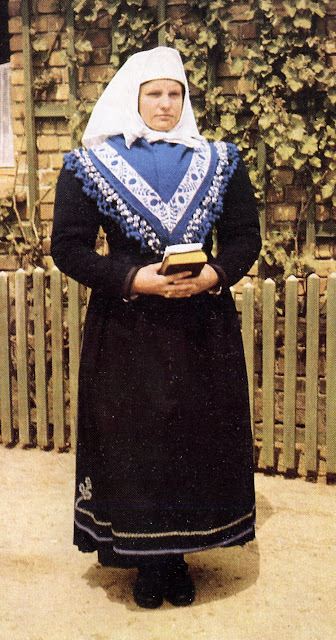 one incapable of comprehensible speech.] 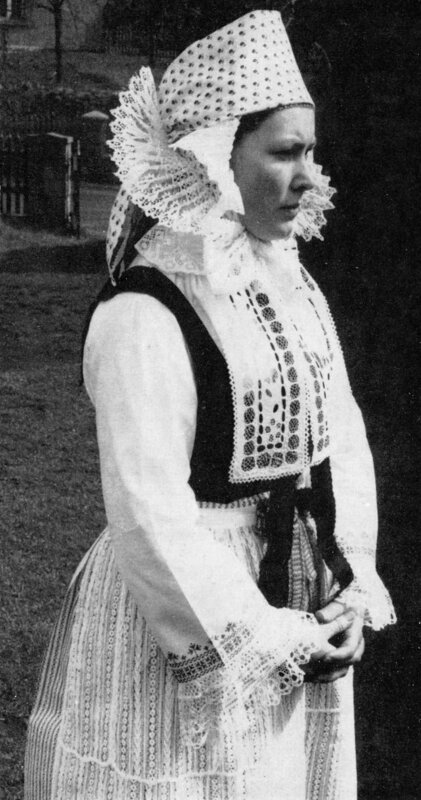 They do not today accept the name of Wend. The Sorbs are a Slavic people who speak a language, or two closely related languages which are similar to Czech and Polish. 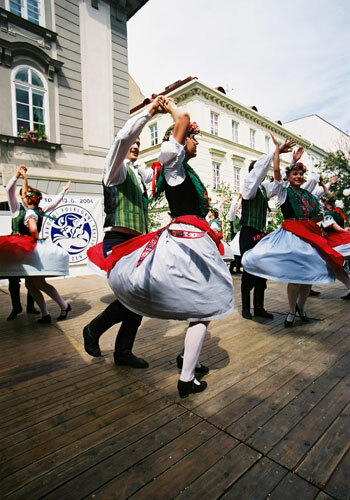 There are two literary standards, Upper Sorbian - Hornjoserbsce, and Lower Sorbian - Dolnoserbski. 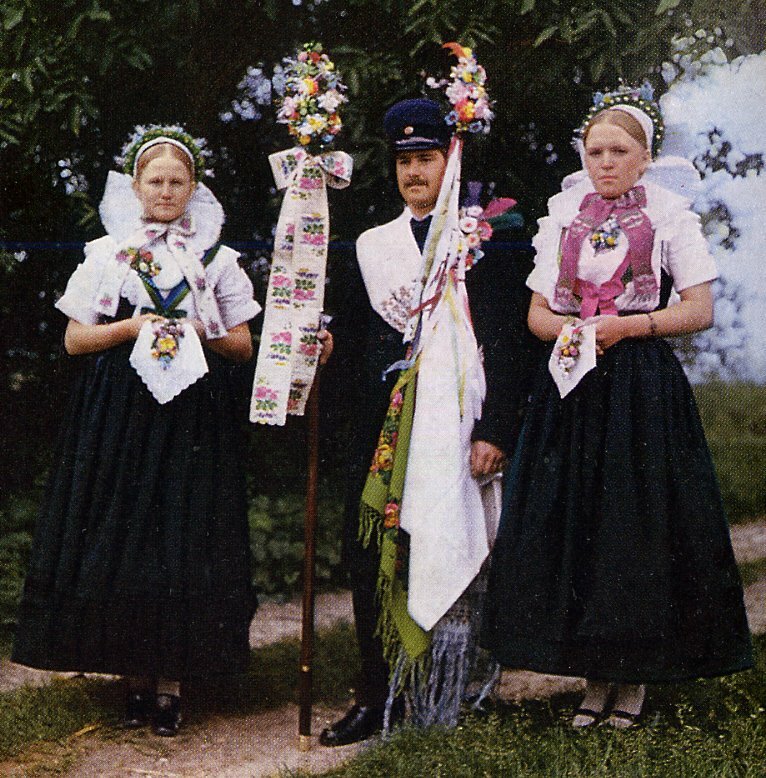 They once occupied a territory from the edge of the Czech Republic and Poland as far north as Berlin along the Spree River, but they have been assimilated by the Germans over much of their historic territory. Here is the location of Lusatia. 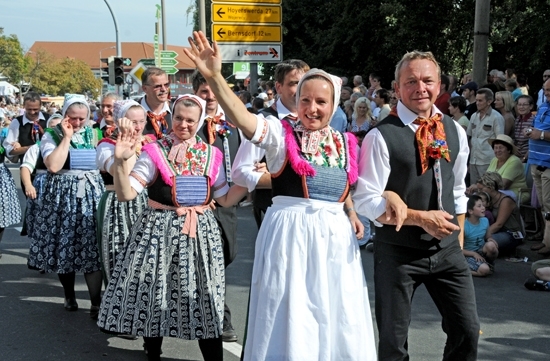 As you can see, it is split between Saxony and Brandenburg. 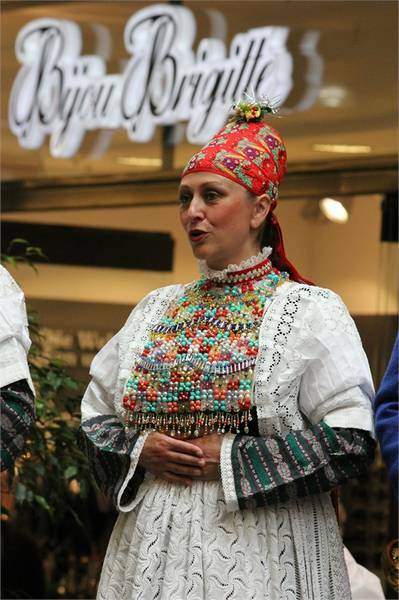 Here is a closer view of Lusatia. 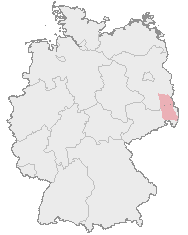 All of the municipalities in this area have names in both German and Sorbian. 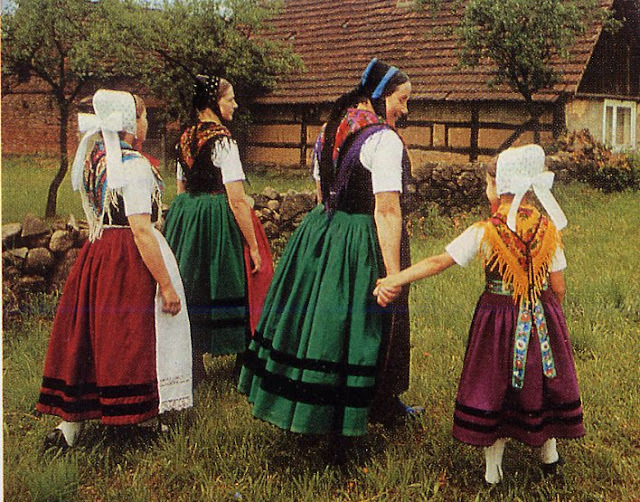 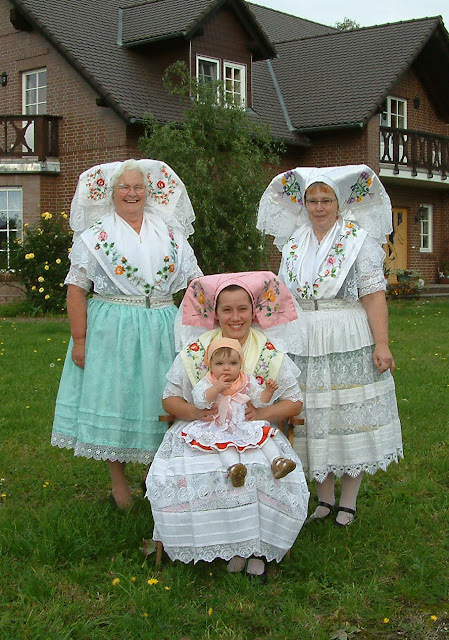 The four generations shown in the initital photograph are wearing the Lower Sorbian Costume from the area of the city of Borkow [Burg]. 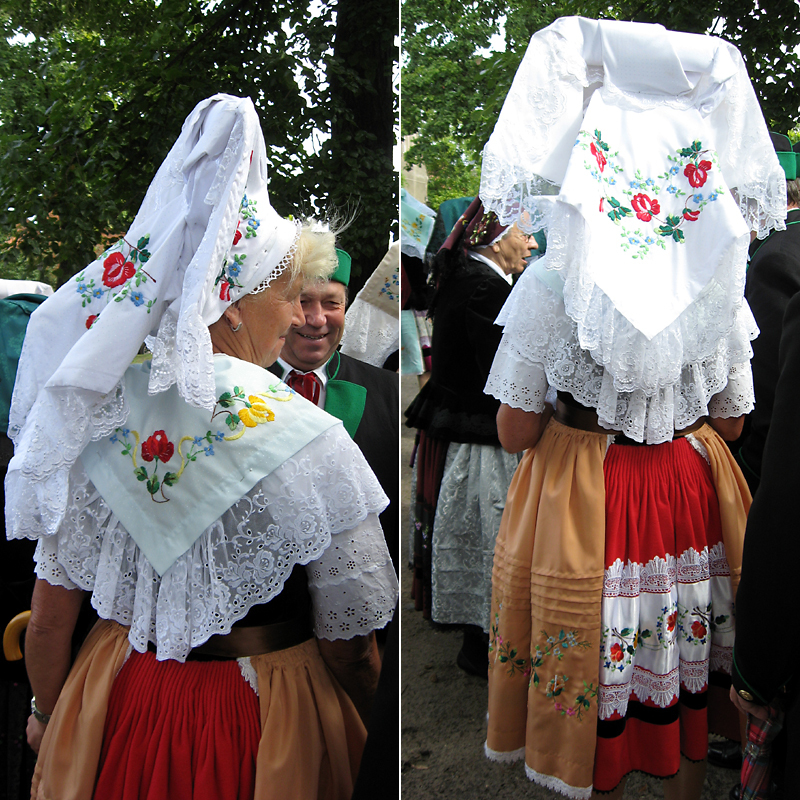 This is worn in one version or another throughout the region of Chóśebuz (Cottbus), The headdress is meant to look like one very large scarf tied in a knot, but its largest iteration is actually made of three separate pieces pinned together. In the everyday costume it is much smaller, and is actually made of one large scarf. 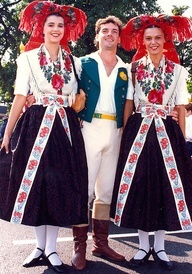 This is the best known of the Sorbian costumes. 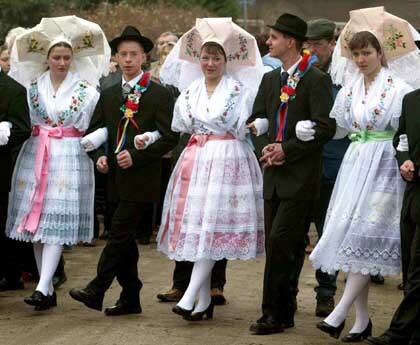 An overview of the costumes of this region is made more difficult by the fact that each local tradition may have a work costume, everyday costume, going out costume, church costume, dance costume, bridal party costume, etc. There are generally considered to be 11 costume regions. 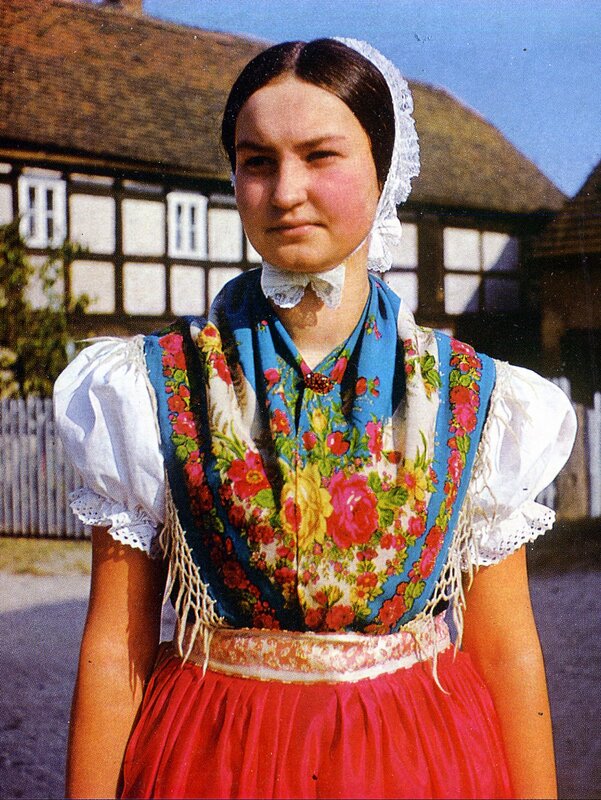 I will name each region first in Sorbian, and then in German. 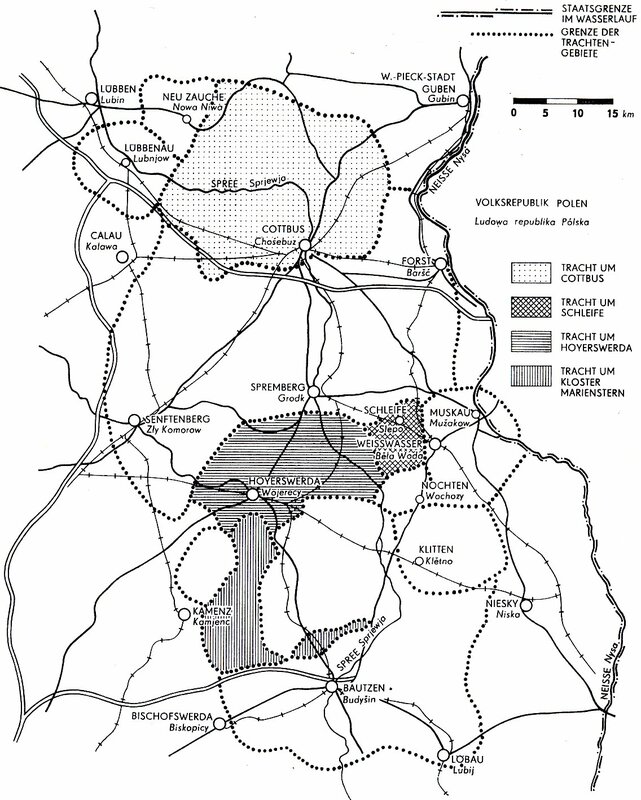 These are all shown on this map above. 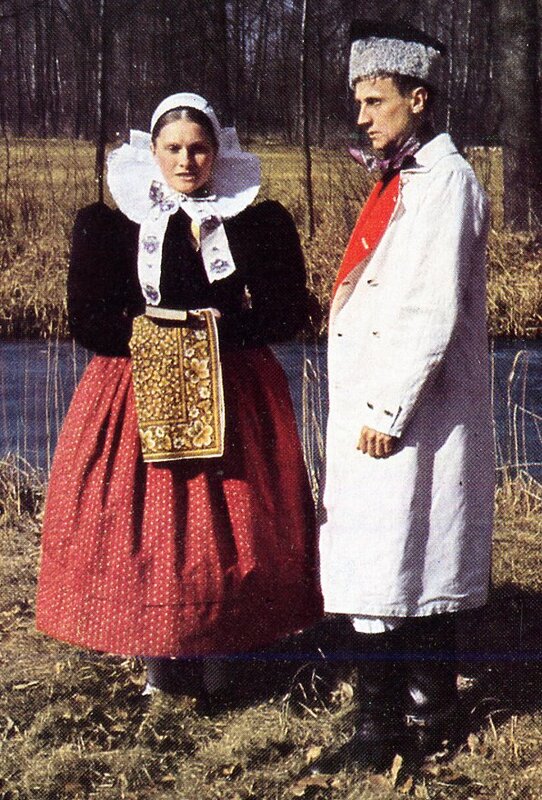 We will travel roughly north to south. Video of a street dance in the town of Hus (Maust), to the northeast of Chóśebuz (Cottbus). The girls have dressed up in the costume but not bothered to put the headdress on. 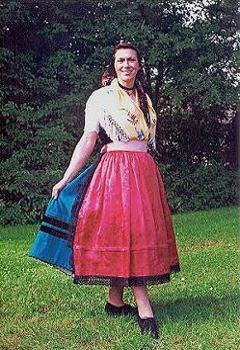 I give you the Annemarie polka. 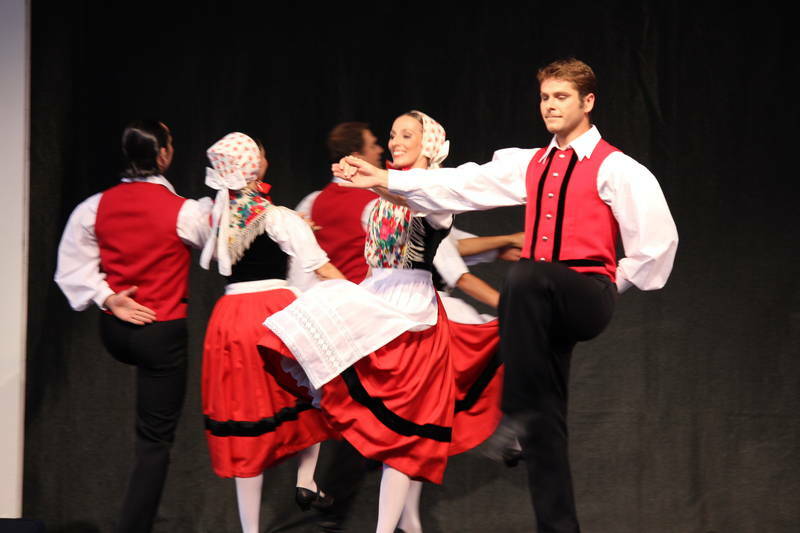 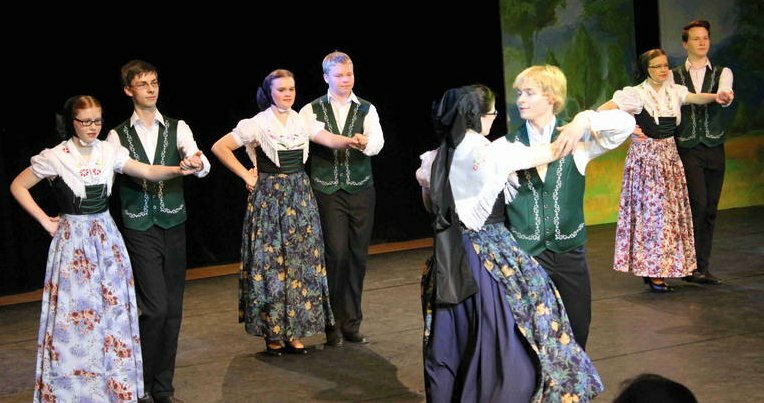 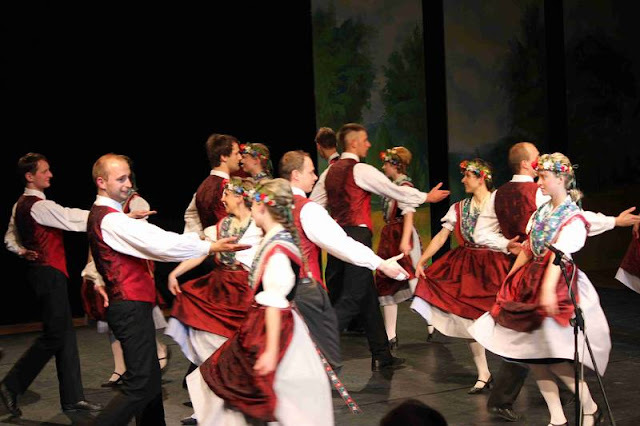 Video of a dance performance from this region by the Sorbian National Ensemble. 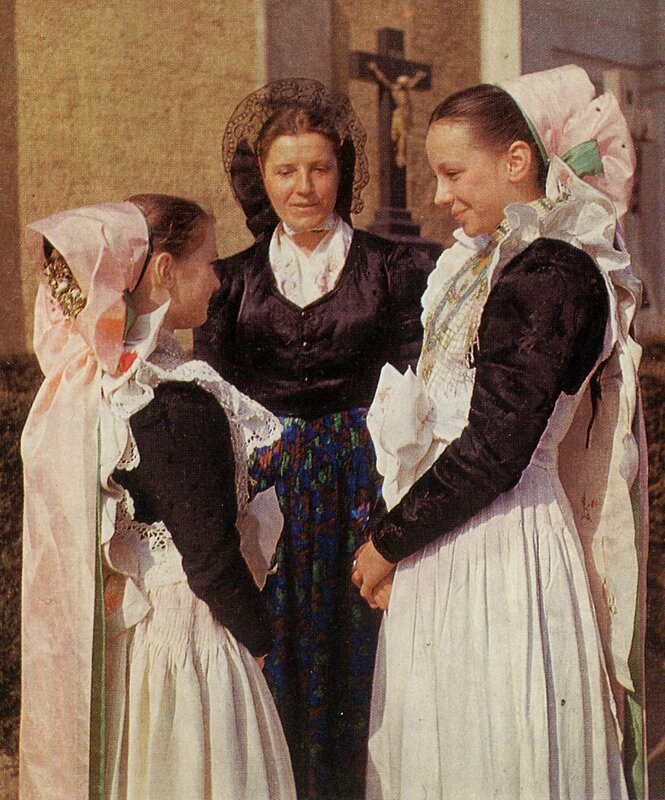 This costume and the following one have overlapping regions, this costume is found in the southern and eastern parts and is only worn by Protestants. 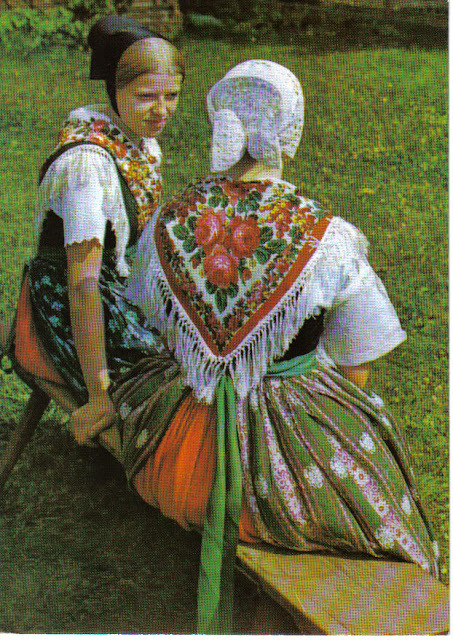 This costume is found in the northern and western areas and is only worn by Catholics. Video of a dance performance from this region. 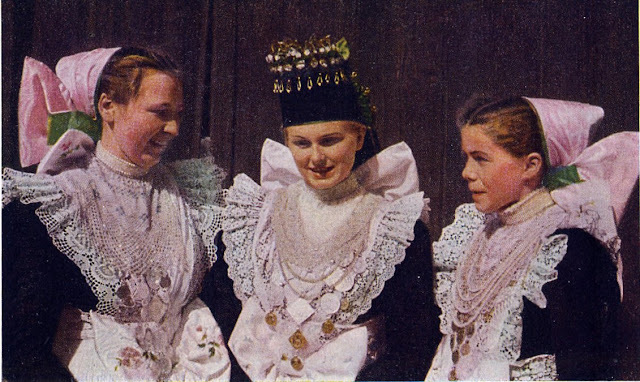 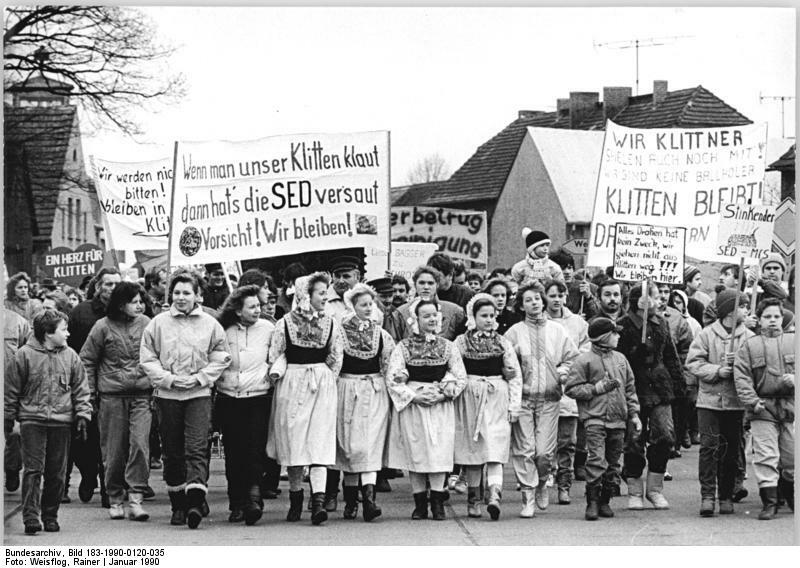 Including one girl dressed as a bride, in the black headdress. 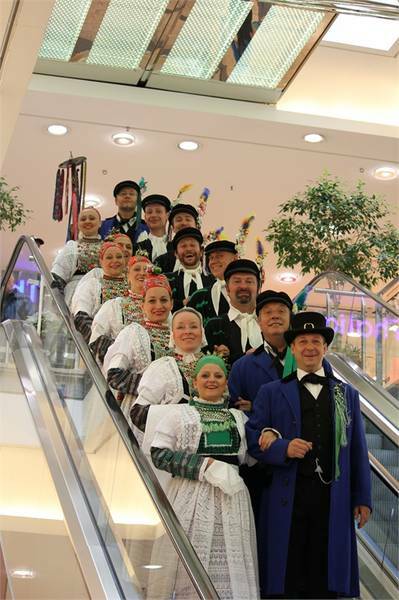 This group is from the town of Wudwor. Slepo (Schleife), and Wojerecy (Hoyerswerda). 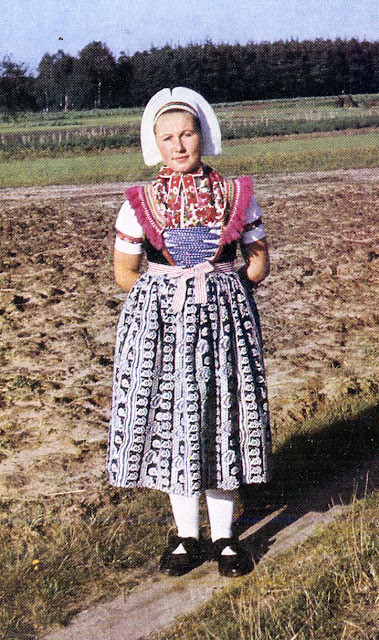 This is known as the 'Half-German' costume, and is sometimes used by dance groups for performances. 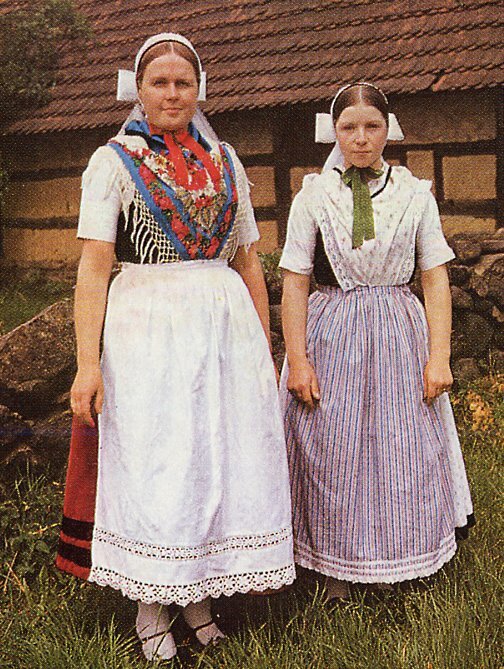 What it lacks in distinctiveness, it makes up for in simplicity and ease of dressing. 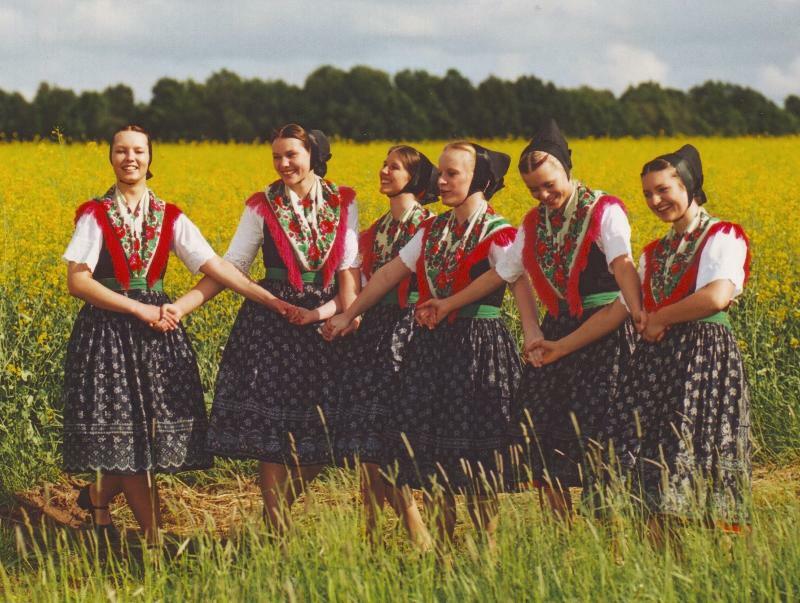 Smjerdźaca, I assume, doing a dance called Hanka. 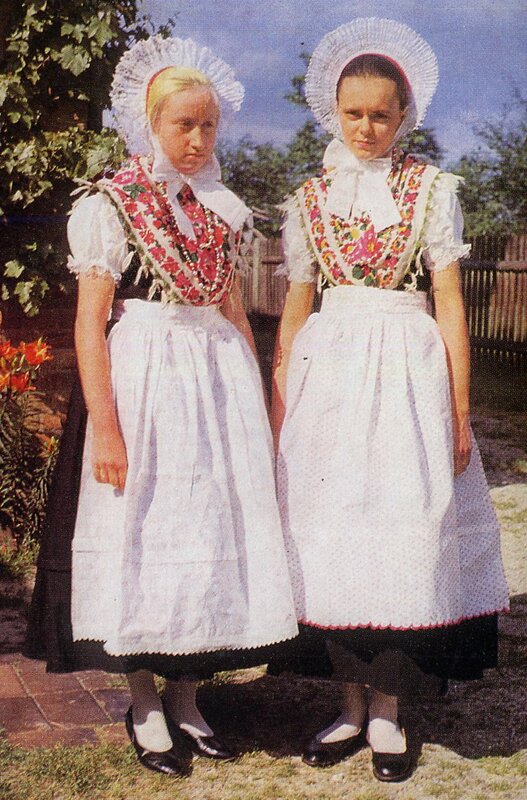 This is, of course, the barest taste of Sorbian Costume. 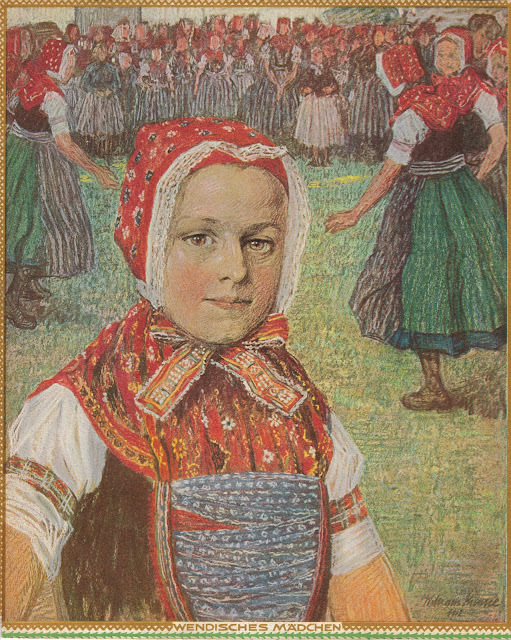 You may notice that in most of the regions above, there was one image that did not fit in with the rest. Usually this is the costume associated with weddings, which differ dramatically from the other costumes used in each area. 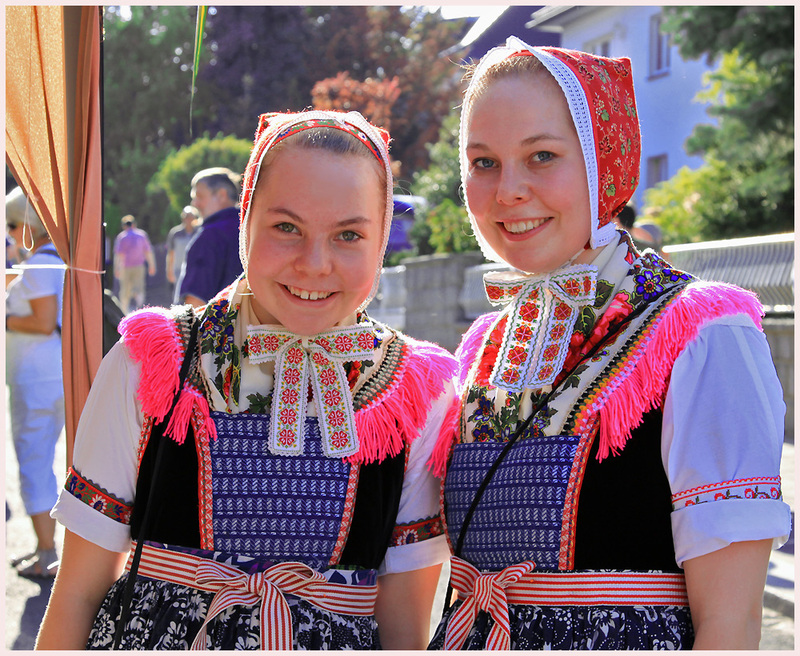 There are, of course, other variations depending on age and occasion. 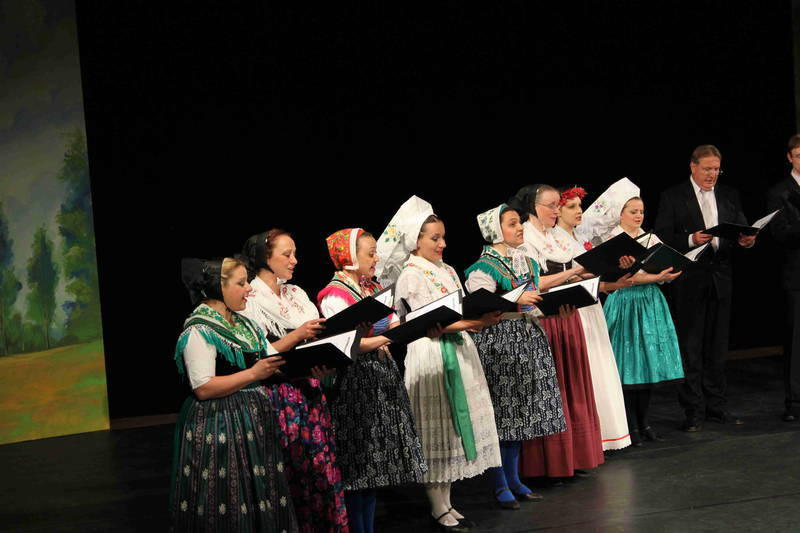 One last image of the Sorbian National Ensemble singing with a mix of costumes. 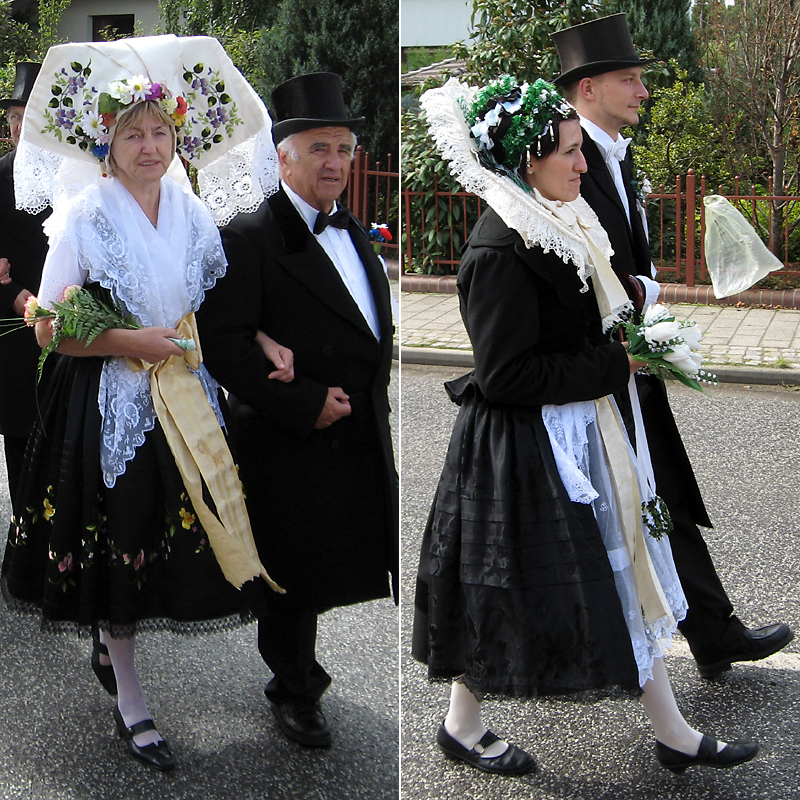 Here is a website which shows some of the variation of the Lower Sorbian costume. 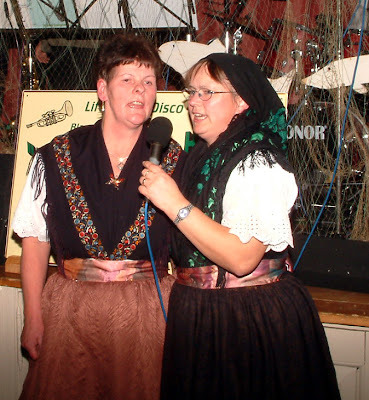 The website is in German. Here is a link to some videos of the performances of the Sorbian National Ensemble.